Since my last post on the tempos of the Reformation-era chorales, my thinking on tempo has developed yet further. In my previous post, I wrote that a tempo of about 120 BPM seemed about right for most of the early chorales. I then overhauled many of the audio files accordingly. The response from users was that the audio files were now too fast, and upon further reflection, I have to agree. This has driven me to further research and experimentation, which has led to the following conclusions: 1. I was correct in thinking earlier that the tactus in the early chorales corresponds to the breve. 2. I was wrong to think that the tactus as employed for the early chorales was as fast as 60 BPM. 3. The true tempo is best found by considering the speed at which the polyphonic arrangements are best sung. 4. A tactus of about 50 BPM yields a workable tempo for melodies in both 4/4 and 3/4, and allows Walter’s polyphonic arrangements to be sung with the semiminim (the shortest note value he uses in his 1524/5 collection) at a satisfying speed for the frequent mordents. By God’s free grace and fa- – vor. The opening of “Dies sind die heilgen zehn Gebot.” The hymn is in cut time. The two rests, semibreve and minim in value, when added to the minim pickup note, come to one breve, which I identify with one measure. The rests are not necessary for performance. I therefore take them as giving the singer a sense of where the pickup note falls in the metrical structure. This is surely how the hymn was intended to be sung. Furthermore, as pointed out in my previous post, this understanding of the relationship of the tactus to the notes is reflected in the arrangement of rests before the pickup: If there is a pickup of one minim, it is preceded by one semibreve rest and one minim rest. 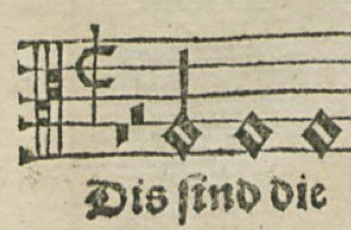 One can imagine beating the tactus with one’s hand striking downward at the semibreve rest, then upward for the minim rest, followed by the pickup note before striking downward again for the first accented syllable. If the tactus is beaten at a rate of about 50 BPM, which would be at the extreme slow end of the range suggested by the sources, then in our modern notation, with the note values halved, a singable tempo of 100 half notes per minute results. This also allows Walter’s arrangements to be sung at a tempo that seems perhaps a bit rushed, but leads to the semiminims, our eighth notes, being sung at just the right speed. One further consideration leads me to posit a tactus of about 50 BPM corresponding to one breve. When hymns are notated in the equivalent to our 3/4, one breve represents three semibreves rather than two. In this case the tactus manifestly corresponds to the breve. This is called tactus inaequalis, because unlike the standard tactus aequalis, with an equal downbeat and upbeat, the 3/4 tactus requires the downbeat to be twice as long as the upbeat. Three subdivisions under tactus inaequalis corresponds to two subdivisions in tactus aequalis. If both “Salvation unto Us Has Come” and “All Glory Be to God on High” are sung with each measure at 50 per minute, or each quarter note in the case of the latter being sung at 150 BPM, the result is that both are eminently singable. If the tactus corresponds to the breve, that is, to one measure of our notation in 2/2 or 3/4, then a tempo of 60 measures per minute, or 120 BPM, is simply too fast. In particular, it renders the polyphonic arrangements hopelessly rushed. But 50 measures per minute, or 100 BPM, is just about right, and is within the accepted limits of tactus speed for the period. I am not aware of any modern performances of the polyphonic arrangements that are sung that quickly, but each performance involves a certain amount of conjecture anyway. And there is no reason that such arrangements couldn’t be sung slower than 50 measures per minute if need be. Of course, I say all this with the awareness that we ought not to be too precise about such matters. But since I am required to enter a specific tempo into my music software to produce the audio files for this site, I have to settle somewhere. A tempo common to the polyphonic and homophonic arrangements allows them to be sung/played successively with the relationships between the two easily perceived. What do you think of the tempo of the hymns on this site? Have you found them too fast? Too slow? At what rate do you sing the chorales in your household? In your congregation? This entry was posted in Articles on August 10, 2014 by Christopher Neuendorf.